Swindon. A place I’d never visited in all of my 40-something years. Famous for it’s railway connections, the UK’s first lending library and Billie Piper (Doctor Who fans will know who she is, as well as hapless DJs like me, who played her tunes around the turn of the Century). It’s then Local Authority-owned bus operator Thamesdown scooped the prestigious “Operator of the Year” gong at the UK Bus Awards in 2011. My fellow bus nut pal Mark and I decided on a visit. It had actually centred around a last trip on Oxford Bus Company’s short-lived Oxford – Birmingham Airport service – “short-lived” because it’s facing the axe less than a year after being introduced. A trip between Oxford and Swindon on Stagecoach’s 66 Gold service would fit nicely in between. We join the coach at Birmingham International station, and it’s spot on time. £20 for a day return – maybe it seems a tad steep, but that’s the way with premium airport services. After looping around Birmingham Airport, we leave for the Warwickshire countryside with 8 on board. It’s a nice ride towards the City of Dreaming Spires and we arrive, uneventfully, into Gloucester Green bus station where Oxford Bus Company and Stagecoach are doing battle for the lucrative London market. All the dollar is to made by folk heading south, it seems. Also in the mix here are some Stagecoach Gold services. They are impressive beasts. We’re hunting a 66 to Swindon, but less impressive is the lack of departure. Our more-diminished beast rolls in almost 15 minutes down, and the incoming man on the upper deck front seat is fast asleep. Everyone piles off and the new takers immediately board, our man away with the fairies suddenly leaping up and making a sharp exit. An Adult Explorer is £7.00, and once relieved of our coinage, we’re off on the upper deck and away. Soon, we’re out of the City and into the greenery of a glorious English springtime. The service passes through Faringdon, a delightful location including The Old Crown – a 16th Century coaching Inn, where the original stagecoaches (in an era known as pre-Souter) plied their trade. The modern-day ones stop right outside. You can imagine Piper reminiscing in some TV documentary about her school days, spending Saturday afternoons singing into the end of a hair brush in Swindon bus station before becoming famous. Or maybe she avoided it completely. Given the choice, most people probably would. If first impressions count, this one certainly isn’t getting a second date. After leaving the luxurious surroundings of the Gold offering, this is like a very bad 1970s nightmare. I wander up and down, taking in the utter despair this place emits. It shouts out that bus travel is the very last resort. I feel a heady mix of sadness, frustration and absolute despondency. Pigeons and their excrement loom large. Threatening notices about the right to confiscate your alcohol are fastened to fences. Information is poor, although Stagecoach does have an office here (no 66 timetables are on offer though). If you’re new to buses here, a lack of an index to places served doesn’t help – the nearest thing is a very basic list of services on each stand. Concrete walkways abound, it looks threatening enough in the middle of the day, so goodness only knows what a young Billie Piper might have felt like hanging around here after dark. It looks like the longer-distance services go from here. But if you follow the concrete maze away from this transport hell, you come to an equally 70s-inspired flyover-type arrangement called Fleming Way. Here, Thamesdown has an enquiry office, and we run in like excited kids into a record shop (remember them? ), about to get our hands on the new Billie Piper album (the first one – it was better). There’s real-time information on offer at the on-street stands too. Thamesdown’s information is good – although my first impression of the ticketing zones was one of confusion. There are 4 – inner, outer, plus and network. Is this really necessary? In fact, the more I scrutinise the leaflet as an outsider, the more baffling it becomes. We settle for a £4 Day Rider, as we’ve only got a couple of hours and drop our fare into another 70s phenomenon – the exact fare box. But at least this will soon be history, as since the company has been taken over by Go Ahead, customer-friendly change will soon be given. Actually, there is nothing yet to suggest Go Ahead ownership. It’s early days, but I’d half-expected something subtle like some “we’re part of the Go Ahead Group” stickers somewhere, as appeared quite quickly on the Plymouth Citybus takeover. The Dayrider appears to be valid on Stagecoach buses in the area as well. The beachball-liveried challengers have long-existed here too, but it seems that they’re upping the ante now that Thamesdown are in private hands. One to watch for the bus-observers in the coming months and years, methinks. We’ve randomly chosen a 19 to somewhere called Sparcells, as it’s a Scania double decker. I bound upstairs and claim the front seat, like maybe a young Billie Piper might and we’re off around the outskirts of the town, past the ghosts of Swindon’s railway heritage. Ex-engine sheds are everywhere. The bus is decent enough, but unexciting. It’s getting on in age and ground-in dirt inevitably shows. Me and Mark contemplate possible reasons as to why the Council has flogged the company to private hands. For all the successes of Council-owned operations such as Nottingham and Reading, this is a sobering reminder that not all of this genre glitters. Is it inevitable politics that leads to Councils concluding that other parts of their empire are further up the pecking order? Or has bus industry stagnation hit this part of Wiltshire? We have no idea where the 19 terminus is. The service traverses a posh-looking new build housing estate and stops for a few moments just beyond this. The bus stop pole contains good information and prices. We expect to be kicked off, as we suspect it’s the end of the line, but we’re soon on our way back through the posh estate, so we think we’re heading back into Town. The driving itself is a bit on the “urgent” side, but our bus takes it well, and we pass an “extreme trampoline park” and further reminders of steam trains in the form of “Brunel Dental Practice”. I’m slightly disappointed to see no cashing in on Billie Piper’s fame. Back in Fleming Way, an awaiting driver puffs on his vape. Information on stand here is better than the disastrous bus station. Next up, a move to Great Western Hospital on route 1. It’s every 10 minutes, so plenty of buses on this one. Within moments, an elderly single deck Dennis Dart has appeared, and our electric fag-puffing man has vaped his last for a while and takes over our steed. Ah, driver changeovers. There’s only one place I’ve seen a fast, efficient driver changeover – TrentBarton in Nottingham. I don’t know what they do, but they have it far better than most other bus operation I experience around the country. This one is no different, and seems to take an age. Intending passengers shuffle in boredom. Eventually, we’re allowed on and take off hospital-bound. It’s another uneventful trip. The bus is 15 years old, but is unremarkable. Our now vape-less driver negotiates the Magic Roundabout like he’s done it thousands of times before (I dare say he has), and soon enough, we’re at the Hospital. Just across the way, we spot a 12 on-stand, which is heading back into town via a different route. We decide on immediate action but our sprint reveals how a lifestyle bereft of regular exercise is no good at all when it comes to running for buses. It’s a surprise that no one from the Hospital comes out and drags us in as we board our next Dart with our faces a deeper shade than that of a passing Salisbury Reds service. We needn’t have rushed as our driver is out of the cab deep in conversation on the phone. The 12 returns to Town via the Old Town and provides a contrast to the more direct and frequent 1. Again, the bus is well-presented for it’s age. We’re back in the Town Centre, and evening peak is rapidly advancing. We’re aware of the time of our last coach back up to the Midlands from Oxford, so it’s time to hop back on Stagecoach’s 66. A sensible use of the toilet facilities back in the bus station is thwarted by the fact that they appear to close at 4.45pm (do the vandals start early here?). The 66 is on stand for a 5pm departure, and it has a decent take-up. But it’s disappointing to find the upper deck windows are absolutely filthy – and I’m inclined to believe that this isn’t one day’s worth of filth, either. It isn’t becoming of such a premium offering. “there’s so much more to see” – but not out of this filthy window! Design Guru Ray Stenning has subsequently taken me to task, by reminding me of the fact that Swindon’s most famous star is the irreplaceable Diana Dors. Just imagine her admiring the classic lines of half-cabs in the days when buses were real buses! Sigh…..
With all the furore over “fake news”, The Bus Tracker notes with interest some excitable happenings over the altogether more sedate world of bus stops. First up, none other than “National Treasure” (as described by The Daily Mail) Dame Judi Dench, who managed to get involved in some low-key whinge from a bus driver whilst on some jolly stunt involving a pub landlord and a fake bus stop. The shenanigans involves some cheeky pub boss in Kent who erected a bus stop outside his boozer, claiming that he’d doubled his takings by doing similar in 2015. So he invited his friend the Dame to attend the “opening” of his new one and stick her hand out for the next Metrobus-operated 291. The driver duly pulled up and then realised it was part of a wheeze – especially when the film star didn’t even get on. “Well that was a waste of time”, he was supposedly heard to mutter. In further intrigue, the Landlord claims to have found the bus stop pole “in the bushes”…. In the equally sedate area of Harrogate, suggestions of skulduggery involving missing timetable information. Local independent Connexions Buses is complaining that all of it’s timetables have disappeared from timetable cases on the route between Harrogate and Knaresborough – a route that sees competition from Transdev. North Yorkshire County Council aren’t getting involved (despite them owning said cases). Transdev claimed information relating to their own services has been “covered up” – so they’ve produced a replacement that shows all operators services on the corridor. Now isn’t that a grown up response? Perusing my copy of Coach & Bus Week whilst actually on a bus set me off on another deep and meaningful ponder of the state of the industry at the moment. One of the news items referred to National Express Group – and the fact that strong overall growth has offset a “slowdown” in it’s bus division. National Express West Midlands is my local operator, and I use it and watch it’s fortunes closely. NXWM has had an uplift in recent years. The driving skills are much improved, the buses look more attractive in their gorgeous crimson livery, a new “Platinum” product has been rolled out, brand-awareness is much-improved, and new fare offers have been introduced (although at the danger of becoming confusing due to the sheer number of alternatives). So what’s the fuss? Commercial revenue is up 2%, but offset by an expected decline in concessionary income to balance out at 0.1% growth overall. It all feels a bit, well, flat – if figures like that are your thing. On the buses themselves as a passenger, it feels probably the best it has in many a year. But here’s the rub – the one thing that could be a game-changer is not in the control of the operator – reliability. It has become very apparent in the suburban West Midlands – as noted elsewhere – that congestion has rapidly become a massive issue again. If the buses are posh, with extra legroom, comfy seats and free WiFi, the journey itself is as bad as it’s ever been. There are tailbacks everywhere – some not entirely predictable either, with the end reason being simply too much traffic for no particular reason. It’s “white van man” delivering goods ordered online – which in turn means less trips to the High Street , taxis (Uber and others) and a general upturn in car traffic, possibly brought on by the feeling that petrol costs aren’t rising by much and another feeling that we might finally be seeing the end of the financial crisis that has gripped us for the best part of a decade. People are getting out and about in their private vehicles, and the bus can’t find it’s way through effectively. How about giving the bus it’s own permanent way? In Cambridge and Manchester to name but two, buses rank much higher on the clapometer, because of the guided busways. But these are rare incursions into an otherwise typical urban landscape. Giving the bus priority to make them more reliable and thus more attractive involves, yes – you’ve guessed it – more space on the tarmac at the expense of other road users. And for most Councillors, that’s too much of a vote risk. One of my Facebook friends suggests Bus Users UK fielding candidates in elections to raise the profile of bus users in all of this. Good shout – except who’s footing the bill for the deposit, which may well be forfeited? It opens up even more ponderings on my journey – who is shouting for the bus user’s lot? Bus Users UK do a sterling job (disclaimer: I used to work for them), as do Transport Focus (ditto disclaimer) – but getting that into the mainstream media on a regular basis to hammer it home is nigh on impossible – because the campaign for more bus priority is, frankly, boring. And up against the army of motorists who believe that there is some sort of phony “war” against them anyway (laughable – they’ve never had it so good) – well, you might as well forget it. If National Express West Midlands had a network of routes that had buses actually beating the car drivers stuck in their little tin boxes on bus priority that had stringent fines attached for misuse, they’d be raking it in. No question. Instead, we have on the local TV news the very day I’m writing this, a story about how bus lane cameras are bringing in thousands every week from errant motorists who are either hopeless at reading large signs or think the rules don’t apply to them and thus break them – then cry wolf to the media when the fine pops through the letter box. The story is a lazy one, and rarely changes in context. I well recall myself appearing on TV and Radio to defend such scenarios – and setting myself up as public enemy number one in the process. Furthermore on the day I write this, I hear from a friend in the industry that part of what precious bus priority there is in Wolverhampton is being removed shortly “to aid traffic flow”. This is in the City where a few years ago, a local “business leader” stood at a traffic junction one morning, pen and paper in hand, to attempt to count the number of passengers on passing buses to see if he could prove that bus priority wasn’t needed. Yes folks. It actually came to that. Across the conurbation in Coventry, we have a number of bus lanes currently suspended to see if it “helps traffic flow”. You can bet most if not all of them won’t be reinstated. What a depressing state of affairs. I also hear from industry sources that Uber and the taxi trade are “killing” the night time bus trade in Birmingham. Maybe that’s to be expected when looking at the night time economy in some respects, but the danger is that the taxi trade and Uber in particular start making real inroads into daytime travel. Imagine something like an app offer along the lines of “3 rides for £12”. Yes, it’s still more expensive than a day ticket for the bus, but the trade off is hassle-free door to door mobility. If the economy is picking up, people may well consider ball-park prices in this way, because unless you’re a strange transport geek like me who rides about on buses to examine the science, the only real reason people catch buses is to get from A to B. If there is no real prospect of getting there any quicker on the bus, and you can drive, you’ll drive. We don’t do long-term thinking in this country. In the 60s, when everyone was buying cars and the railways were a dead duck, no one had the foresight to think that, maybe, when everybody has bought a car, we might see mass gridlock, and railways might be needed after all. No. We sent in Dr Beeching and we all know what happened there. Today, we’ve learnt none of these lessons. We get rid of bus lanes for supposed short-term gain. Maybe even to appease the motorist, come election time. Instead, we have an impending Buses Bill that doesn’t definitively address the biggest concern of the bus industry and it’s users – congestion. The income from concessionary fares – another huge thorn in the side of operators – isn’t mentioned. And please can we put a sock in it when some people talk about concessionary fares being a “subsidy to the bus industry” – it isn’t anything of the sort. In the case of the NXWM “disappointing results”, I feel sorry for them. The company has tried hard to raise the image and standard of bus travel in the West Midlands. I don’t really know what more they can do or could have done. The latest role of the dice is dirt-cheap tickets for users in Dudley & Sandwell. It’s undoubtedly worth a go, but it’s papering around the edges – congestion remains the biggest killer by far. Who knows if NX’s CEO Dean Finch will throw in the towel when it comes to the underperforming bus division? He has done with UK rail. Are buses getting in the way when there are seemingly more exciting opportunities in North America, Spain, Morocco, German rail and, of course, the iconic white coach brand? That, of course, is pure speculation – but I’ve long-thought that some parts of the “Big 5” might merge at some point. That’s business. The hard-headed commercial reality of bus operation today. But what about the other aspects of having a well-functioning bus service? We somehow have to get away from this idea that buses are the mode of last-resort. Now that’s much harder said than done. Today I have made a journey during the evening peak from Birmingham to Dudley. It tried the patience of even this committed bus user. Congestion was as bad as ever, someone had something loosely described as “music” emanating from a tinny mobile phone speaker, whilst another smoked something disgusting, which mingled in with the smell of what could only be described as close-to-rotting chicken. It was an appalling journey in every respect, and if I wasn’t a fine connoisseur of public transport, I’d be thinking about getting a car if I had to make that journey regularly. Which of course, would only make the congestion worse, and leave the pot-smoking, rotten-chicken-scoffing undesirables to increase in number. We somehow need to turn this downward spiral into a virtuous circle – and it’s not easy at all. I keep returning again and again to congestion – and the need for the bus to cut through it. The industry is probably doing all it can on their part. There are new buses everywhere, ticket deals, WiFi, posh seats, you name it. What isn’t needed are franchises and “London-style operations”, oft-spoken by local politicians who clearly don’t grasp the magnitude of what might be needed to achieve that. The Buses Bill is a side show. We have a hardy, resilient bus industry which, when paired with Local Authorities who share the same goal, can achieve great things. But we need politicians – local and national – who can see the benefit to society of the long game. To take the admittedly difficult and unpopular decisions to grant more – not less – bus priority that will see the bus whizz past stationary motorists and create a true game-changer. How we need an extraordinary mix of Ken Livingstone, Sir Brian Souter and Mystic Meg to see us through the coming years! Technology has taken over the World. Hellfire – I’m even writing this on a mobile phone! But as I immerse myself in my grouch-like mid-40s “middle age”, I often consider the downside to our seemingly ever-increasing reliance on all things cyber. In my day job on the railways, I notice the rise and rise of mobile phone ticketing. Everything, it seems, can be stored in our hand-held devices. On a journey this morning on the Stourbridge branch line, every passenger (around 15 of them) was peering into their phone. Every last one. The convenience is well known and appreciated, but I worry that we’re heading towards a scenario whereby a major hack (by the Russians or whoever – possibly some 13 year-old kid I’ve just told off for not having a ticket, maybe) will throw millions of us into a blind panic. People of my age (hark at me) can remember a time before tech. We’ll be the last generation. I appreciate “real” things, like actual paper timetables, for example. Yesterday, I went mooching around rural Shropshire by bus – and there were things to consider by ever-ageing old farts like me. One of the reasons I actually planned this mini-jaunt was to use an Arriva Midlands Day ticket – stored on my phone. I’d embraced this techy world last year, when the aquamarine crew held a “flash sale” of mobile tickets. Hence the £6.20 product was on offer for a short time at half price. I bought 2 and stored them on my phone. And there they lay, quietly, until I fancied a roam around the large Arriva Midlands patch. Except when I upgraded my handset just after Christmas, the promised “easy transfer of apps” was anything but. My Arriva app didn’t appear on my new phone. So I downloaded it again. But I couldn’t log in. So I re-registered. But my tickets weren’t there. Somewhere in cyberspace lay 2x Arriva Day tickets. Then I had an email from Arriva telling me I had 4 days left to transfer my tickets to their new app. They’d been emailing me about it. (They hadn’t). But it was OK. All I had to do was click the link below and they would magically appear on my new phone. (I clicked. Nothing happened). I emailed Arriva. They didn’t reply, but I received another automated email saying I really had to get a move on clicking the link below to transfer my m-tickets across. So, with nothing much happening, I went on my Shropshire romp the good old-fashioned way – by handing the driver coinage in return for a paper ticket. Of course, as expected, once out and about, Arriva promptly replied to my email telling me that they could see my 2 tickets in cyberspace, but couldn’t see my new app on my new phone. It turns out that, although I had my new phone, I had somehow downloaded the old app – which I thought was the new app. Keep up. I’ll ask questions pub quiz-style at the end. The next day, I downloaded the “new” app, and tried to buy a ticket to see if it worked. It did. Then Arriva emailed me and said joy – they could now see my new app and they transfered my 2 existing day tickets across. So now I have 3…(plus £6.20s worth of paper ticket for the previous day’s travel). The postscript to this jolly romp through the despair of technology was that when checking that I actually had 3 m-tickets to use on my phone, ready and waiting to go, my new Arriva app promptly froze, then said I couldn’t connect to their server! An hour later, everything seemed to have rectified itself and there – finally – in my app “ticket wallet”, sit 3 Arriva day tickets ready to use. But what might have happened should I have been boarding a bus when the server horror show occurred? Such are the potential pitfalls of an over-reliance on tech. Arriva even warns on it’s website that flat mobile phone batteries (that curse of modern day life) cannot be tolerated. In other words, if your phone’s dead, pay up. Of course, there’s nothing else they can say – how many would try that old chestnut if they thought they could get away with it? – but it’s another example of the potential fragility of living your life through your mobile. Another example of this over reliance of tech lies in online timetables. Printing is expensive, say the councils and operators. And they can be quickly out of date. Just check online, they say. So when I found myself halfway between Bridgnorth and Kidderminster, close to the beautiful River Severn, on a plucky Optare Solo, wishing to check my connection times in the carpet town, I was bamboozled by the fact that mobile phone data signals didn’t extend to this lovely little corner of Shropshire. Luckily, in my trusty bag (complete with large British Rail logo from the 6os to remind myself of better days when iconic design was the norm) I possessed a paper copy of said timetable. Yes folks, the old fashioned way didn’t let me down. And I was delighted to pick up, in Shrewsbury bus station, a recently-released copy of a new Shropshire bus map! It’s basic, and has little of the beauty of an FWT product, but it’s there, in my hands, ready to be of use there and then, when I need it. It’s produced by volunteer members of Bus Users UK in Shropshire, with financial help from local independent bus operator Tanat Valley. In an era of cash-strapped Local Authorities, could this be a way forward in other areas? The small independent travel office in Shrewsbury bus station (situated in the back of the newsagents) is also a joy for nostalgia freaks. It resembles something out of the 1970s, with timetables adorning the walls – a mix of professional-looking Arriva ones, dead-basic independent operator ones, local coach holiday brochures, and a handwritten note informing us that photocopies of any timetable are available – for 50p. 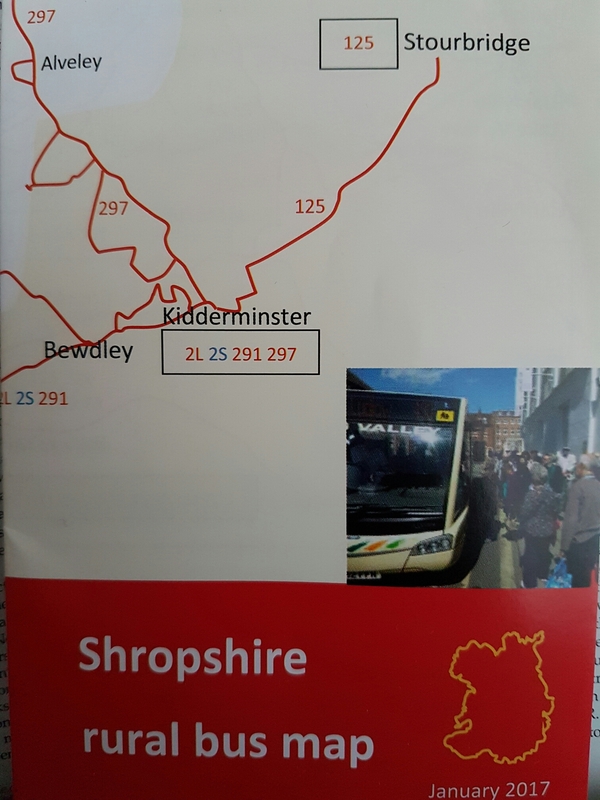 But I recall in my not-so-distant youth, Shropshire County Council providing a really excellent timetable service, which consisted of a ring-binder containing timetables for every bus route in the county, which for an annual subscription they would send updates for. So you had an up to date set of timetables without any need for an Internet connection! They also provided a rather nice map too. Neighbouring Hereford & Worcester (as it was then) did similar, although they did area booklets with subscription to updated leaflets. I suppose it was never going to survive. There has long been an argument about having to pay for timetable booklets at all – which is why most of them don’t exist any more. But I suppose it’s geeks like me who are more than happy to cough up for things of beauty like the Derbyshire booklets and maps. These are the work of real transport professionals who obviously take a pride in their service. The European Rail Guide is another example. Technology has it’s place. This blog wouldn’t exist without it. It provides convenience. But we should caution against it absolutely taking over our lives to the point that, if it all fails big-time, we have nothing left to fall back on. Long live the Shropshire bus map. And the team of volunteers that believe in it.